Jan Leighgton was one of the top TV commercial actors of his time. He is in the Guinness Book of World Records for professionally performing 3,372 historical notables. Jan not only "performed" as figures from history – he was a stickler for authenticity, and had custom-made costumes for hundreds of his characters. Jan Leighton first worked with David in 1979, and his first trip to Ashland, Kentucky is actually mentioned in Jan's obituary in the New York Times. Jan and David went on to work together more than a dozen times, and became close friends. When Jan died in 2009, his daughter, Holly, donated several of Jan's costumes to the the Creativity Center Museum. 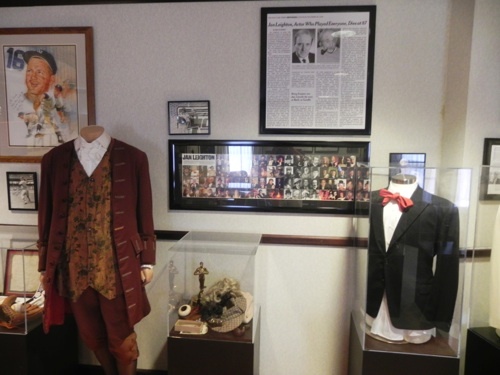 The display is shown in the photo above, and includes both the Ben Franklin and Groucho Marx costumes that Jan wore in these TV spots.